A job manager, which orchestrates either EVL jobs or any other command. Can be used standalone, no need for an EVL installation. 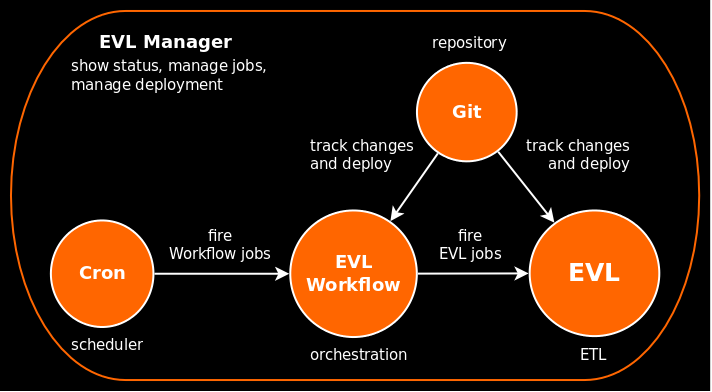 Monitor/run/cancel/restart and manage EVL jobs, EVL Workflow jobs. All three base EVL Tool products—EVL, EVL Workflow, and EVL File Register—are command line based, and can be used together or independently. 1. For detailed list of components see documentation. 2. Community Edition interchange data between components only as text, not in binary format.